A little further north, Blackhead, Black Dome and Thomas Cole are the third, fourth and fifth highest peaks in the northernmost Blackhead Range which transverse the Towns of Jewett and Windham. On the east, the mountains are bounded by an escarpment trail, easily traveled by foot, with views that reach 100 miles up and down the Hudson River Valley. Early in the nineteenth century, American literature and art were captivated by the Catskill’s mysterious lure and dramatic scenery. American literature starting with James Fenimore Cooper celebrated the natural wilderness found here. The legendary fellow, Rip Van Winkle, popularized by Washington Irving, took his 20-year nap in the Catskills. America’s first school of art, the Hudson River School, was inspired by the waterfalls and spectacular views seen from the high peaks of these northern climbs. In the mid-nineteenth century, presidents and the country’s elite came to the Mountain Top wonder at the views below. 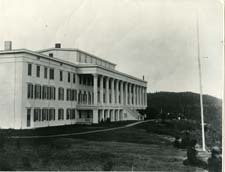 The Catskill Mountain House (right), opened in 1824, prospered through the nineteenth century. Steamships, stagecoaches and later railroads brought hoards of restless city inhabitants escaping the oppressive city heat for the coolness and tranquility of the mountains. The advent of World War I and the automobilecurtailed the summer tourist trade. Tourism was revived by the ski industry in the late twentieth century when the beauty and adventure of the Catskill High Peaks in winter was discovered and promoted. The Mountain Top Historical Society is located on Route 23A, also known as the Rip Van Winkle Trail. This is the site of the old Loxhurst Hotel (left) built in the late 19th century. The property underwent several transformations and was used as a dude ranch in the later half of the 20th century when the Red Barn to the rear of the property was built. 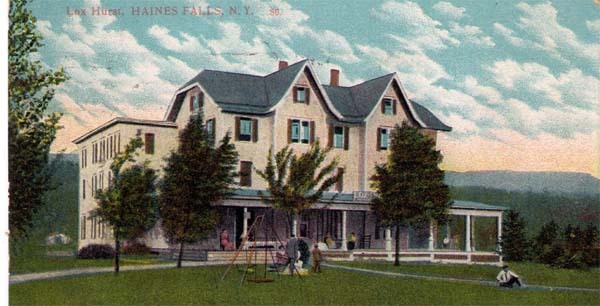 The main hotel building housed La Cascade restaurant (aptly named for the nearby Falls). A fire destroyed the building and in the mid-nineties the property was gifted to the Mountain Top Historical Society. A building that once served as the laundry was moved to the front of the campus and fully renovated in 2005 for use as a Visitor Center. The Visitor and Art Trail Center’s porch and decorative features are reminiscent of the late 19th century Victorian style when traveling to the Mountain Top was both popular and fashionable.